Whatever the reasoning behind it, it tends to come as a bit of a shock to the customer when the salesperson or surveyor raises the thorny issue of a weather rated rebated threshold that fails to meet their perception of ‘seamless’. But once a customer has been educated on the reasons behind the need for a rebated weather rated threshold, they soon come around to seeing it as a necessary evil required to keep out the worst of the UK weather. Of course, that’s not to say that a certain level of ‘low threshold step’ cannot be achieved. It just takes good communication to ensure that the homeowner or builder understands what height the substrate needs to be in order to successfully hide the upstand of their shiny new Bifold door threshold. To achieve the best possible result, it’s essential that the homeowner or builder knows what their internal finished floor level (IFFL) is going to be. Without this dimension, it’s impossible to get a good survey or installation result. If you’re using only the traditional tape measure you are going to struggle to determine this vital dimension. 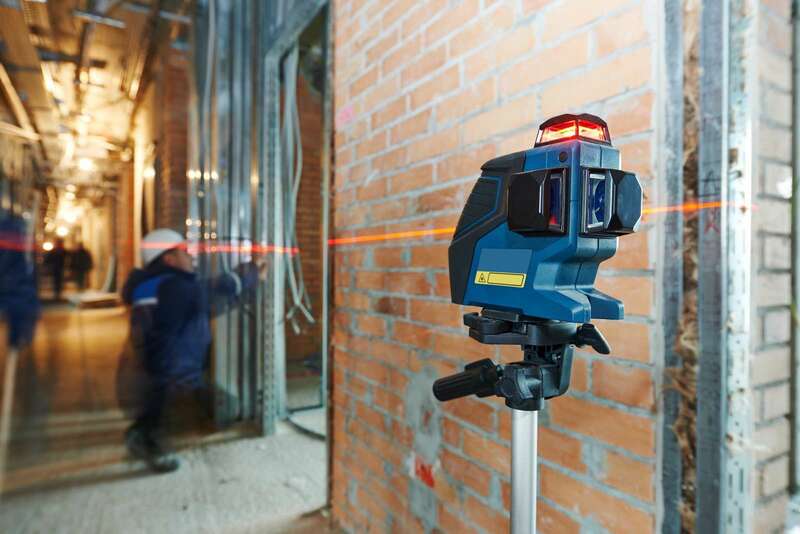 Over the last few years, Laser Levels and Laser Measures have transformed the way in which site surveys are carried out. As Bifolds tend to be fairly wide it’s difficult to singlehandedly measure with accuracy. The race to achieve minimal sight lines means that individual profile sections are becoming ever smaller and can easily twist under strain of heavy glass. A typical threshold section, for example, is usually around 45mm high by 60-70mm deep. 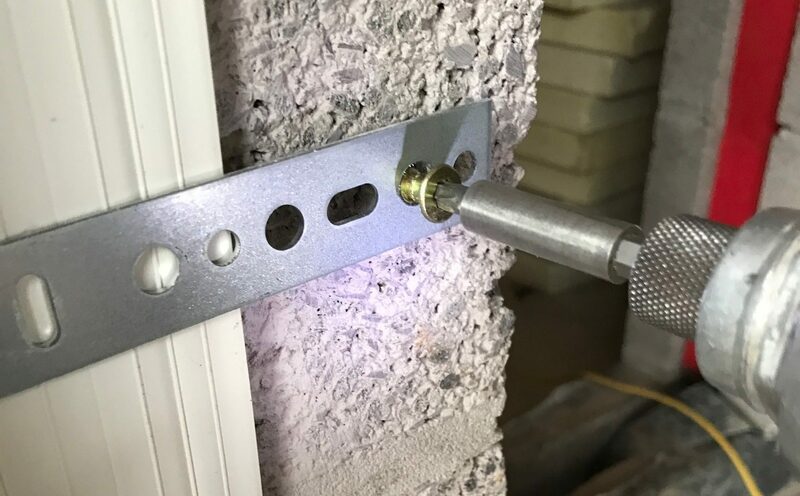 Setting this profile on a not-very-level brick or concrete substrate means that shims have to be inserted at various points in order to get it level. Even on a small 3 panel Bifold with double glazed units installed it’s likely that the entire weight of the 3 glazed panels weighing around 180kgs will be transferred to the rollers. As the roller moves along the threshold track, it’s easy to see how the transferred weight can cause the threshold’s unpacked sections to twist and apply undue stress to the door’s locks, hinges, and other moving parts. The best way to alleviate twisting is to get the substrate threshold level to within 2mm over the width of the opening to ensure that the movement of the rollers does not cause the threshold profile to twist unnecessarily. 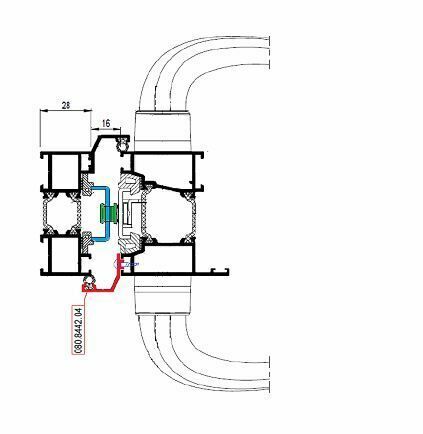 This means the surveyor must provide clear instructions to the builder, in the form of sizes and drawings of the substrate, so that they can ensure that it uniformly supports the Bifold Door Threshold or Cill along its entire length. Unfortunately, the next section is fairly technical and detailed. But its surely better than going through the pain of having to botch the Install or pay for a new set of Bifolds! So please bear with me. It’s safe to say that the days when a surveyor would turn up on site with a pencil, paper, and tape measure are long gone! Before you arrive on site, it’s a good idea to establish that the aperture is actually ready to be measured. It may sound obvious but all too often, a surveyor arrives on site only to find that the opening doesn’t even have 4 sides in place! With the advent of smartphones, it’s simple to ask the customer to take some site photos and email them to you beforehand so you or your surveyor can check that everything is in order. Are all 4 sides of the opening in place? – You don’t want to arrive on site only to find that the lintel or catnic haven’t been installed. Are all steels securely fixed? – We’ve been to sites where steels are only partially fixed, which is no good as they could end up being moved after you’ve measured them. Opening style – how many panels are to move left and/or right? Is there more than 1 set of doors? These may require keyed alike cylinder locking. 3 widths and 3 height dimensions – Laser Measures are great for this due to the large distances. 3 Jamb measurements left and right to check plumb – this can be awkward if you’re onsite dealing with the builder responsible for an out of plumb jamb. But you need to cover yourself by detailing where the discrepancy in the width comes from. Remember that if you’re taking 10mm off the smallest width and a jamb is out by 20mm then you have a gap between the outer frame and substrate of 30mm, which is unlikely to look very good through mastic sealing alone. Access and Parking – It’s always a good idea to let the installers inspect the route to where the Bifold doors will be fitted. Although Bifolds are Installed as replacements for this example we are going to go through the process of measuring for Bifolds being Installed in a new extension. It’s unlikely that at the point of survey the new extension floor will be in place, so you will need to take some finished floor levels in the existing house and transfer these through to the extension floor. Fortunately, a laser level is perfect for doing this. For the purposes of this example its assumed that the existing house floor level will be carried through to the new extension floor. 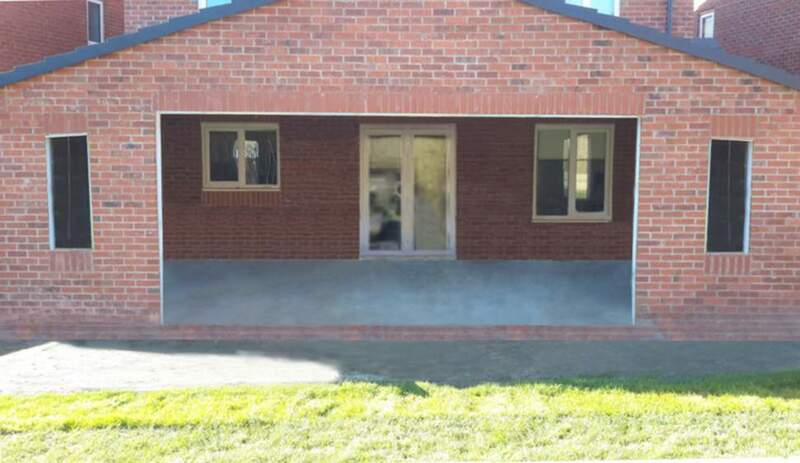 Select a point within the existing house’s finished floor level where the homeowner or builder can then determine the IFFL of the extension floor. Set the laser to a height of 1000mm from the existing house’s Internal Finished Floor Level. Mark the laser line on each jamb of the apertures. This will become the datum line from which the builder will measure down to form the substrate which the Bifold Door will sit on. Select which threshold profile and or cill is required and add 1000mm on to the total. Using CF68 standard threshold with a projecting cill, this will be 69mm. Add the 69mm to the 1000mm datum line, giving 1069mm. This is the measurement from the datum that the new substrate threshold must be built at. Sometimes it needs building up and other times the existing threshold needs to be lowered so that the top internal edge of the aluminium threshold sits flush with the new Internal Finished Floor Level of the extension. With the Laser Level set in its original position at 1000mm above IFFL measure the distance from the laser line to the underside of the lintel at left, centre, and right positions. Each should be uniform. If not then the lintel is not level and adjustments to the manufacturing height of the frame must be made. Move the Laser Level position to approximately 250mm from the jamb line so that a vertical laser line is shown. Take measurements from top, middle and bottom of the laser line to the face of the jamb. If the Jamb is plumb then each of the 3 sizes will be the same. If not, then the Jamb is not plumb and adjustments to the manufacturing width of the frame must be made. Repeat for the opposing Jamb. Taking photos of the site at the time of the survey can make the ordering and Installation of the Bifold Doors go smoothly and eliminates misunderstanding as the job progresses. The following images are actual site photos so not ideal but they do show what to record so you can achieve a greater clarity on every install. Step by step photos can also be used as evidence in the event of a dispute. Hopefully this information has given you a better understanding of how Laser Levels and other modern tools can improve the installation outcome and save on the dreaded remakes! If you would like to use our template survey document, please feel free to download it below.